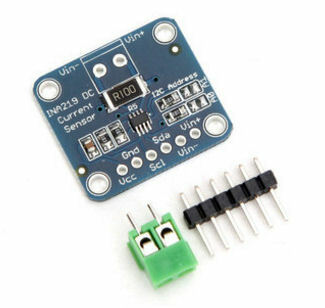 CJMCU-219 module is a I2C interface Bidirectional current / power monitor integrated circuit (IC), and further expand the energy-saving electronic products TI camp. INA219 with the industry's highest accuracy and smallest size, not only to monitor the voltage drop across a shunt resistor on the sensing shunt supply voltage, while also computing power. The device is available in a SOT23 package, providing a small digital current sensing servers, laptops, power supplies, battery management and automotive and telecommunications equipment, low-cost solutions. INA219 in the temperature range -40 ℃ to + 85 ℃ can achieve maximum precision error of 1%, the maximum offset is 100 uV. The high-precision products combine the advantages of 12-bit resolution, as much as possible to help customers reduce the pressure drop on the shunt resistor, thereby minimizing power loss and power consumption and save board space. The device can be sensed bus voltage range of 0 V to +26 V.
Programmable calibration register can be read in units of ampere direct current, and read the power in watts. I2C interface has a timeout setting, not only to prevent bus lock, but also provides high-speed mode, to meet the communication requirements of up to 3.4 MHz. All properties INA219 are software programmable to support.